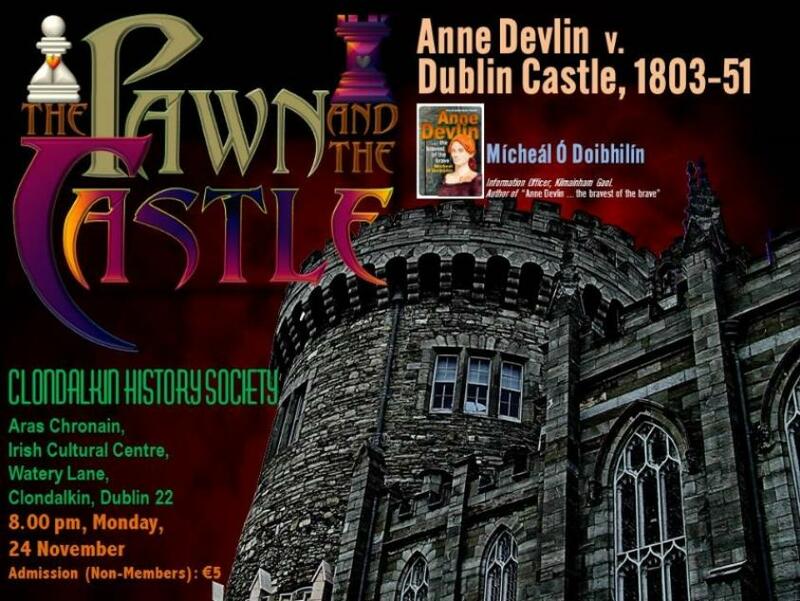 Micheal O Doibhilín, Kilmainham Tales' MD, presented his illustrated talk on Anne Devlin - "The Pawn and the Castle" - in Clondalkin on Monday November 24. Before a capacity audience, and using the latest graphic techniques to illustrate his talk, Micheal put Anne Devlin's life into its tru historical context. The talk focused on Anne's contact with Dublin Castle, in particular Town Major Sirr, Hanlon the Gaoler, and, of course, Dr. Edward Trevor. This was a tale of incredible bravery against all that the forces of the Crown could muster. It is a tale which, were it about a man, we would marvel at. But this is about a woman, who - for 48 years - defied the mightiest empire in the world at the time. Micheal is the author of "Anne Devlin - the bravest of the Brave". See here for further details of the book, or find out more about Micheal himself here.